Happy New Year everyone! I come to you with some wise words in my first post of 2016 which should hopefully help some of you guys out. 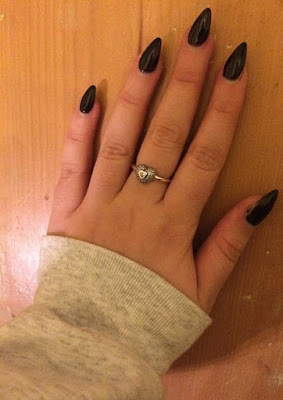 I pretty much always have a set of acrylic nails so I thought I'd provide a few tips on acrylics such as how to make your manicure stay perfect for longer. Firstly, it is imperative that you get your nails done at a reputable salon. I hate to stereotype but the cheap Asian salons are 100% a no go. They usually use plastic tips rather than sculpted acrylic and it's just awful. My friend went to a cheap Asian place and her nails were super sore after, uneven and were basically tips badly secured on to the nail with acrylic. It's just not worth the risk of doing irreparable damage to your nails. I get mine done at a salon which cuts hair, massages and does all the regular beauty salon and spa treatments and I think that this is the hallmark of a decent salon. I am definitely willing to pay within £30-45 price range for a full set and £20 for infills for a quality manicure. My nails are always done by sculpting acrylic into the shape and length that I'd like. This is much better than using tips.. have a research online about the difference as I don't want to fully explain as this post would be very long. But just trust me.. sculpted acrylic is the way to go! When you're new to acrylics, don't go the whole hog and get really long ones as you are likely to catch them and tear them. Accidents are likely when you're new to long nails and it can turn nasty.. trust me! I've fallen up the stairs and fully ripped one of my nails off before now and it was absolutely awful. Ask for them as short as possible and explain that you're new to acrylics and would like to get used to them. This is another reason why it's important to go to an English speaking salon as it avoids any mishaps that could get lost in translation. So to conclude this section: visit a reputable salon and get sensible nails when you're starting out. Most important tip regarding the longevity of your acrylics: Get regular infills! If you get infills then your manicure will last indefinitely until you decide not to get infills on your acrylics anymore. Infills cost much less than getting a new set and it's quicker too so I definitely recommend getting infills when your acrylics grow out. It's also healthier for your nails to get infills rather then removing/growing out your existing acrylics and then getting a whole new set applied. If you don't want to get infills then file your acrylics down regularly and paint your growing nail (at the nail bed) the same colour as your acrylics. This method only works for like a week tops as it can begin to look silly if like half your nail has grown out but it can definitely work if you want to stave off infills or just grow out your acrylics. I tend to wear black, grey or red stiletto nails exclusively so it's easy for me to do this. However, if your nails are patterned or painted in an unusual colour then you will have trouble with this method. You can also use a file to reshape the acrylics when they're growing out. If I want a break from acrylics so I'm not getting infills, I file my sharp stiletto nails down flat once they're grown out and this makes the process much easier and they look a lot less silly. Like I said, I always have a set of acrylics. I take around a week-long break during the year which would consist of an odd day here and there due to changing over the colour or style of my acrylics. I am under no illusion that this severely weakens and damages my nails. In terms of attempting to mitigate damage, getting infills rather than full sets definitely makes a difference like I said. It's also important to regularly massage Bio Oil/Vitamin E Oil/Jojoba Oil/Cocoa Butter into your nails, cuticles and surrounding skin. This helps to regenerate, nourish and moisturise the tissue. In between manicures, use a product such as OPI Nail Envy as it's wonderful for strengthening the nails. Finally, visit a professional, reputable salon like I said! It really is so important in terms of preventing any long-lasting damage. I hope that you guys enjoyed this post.. have fun with your flawless, long-lasting, chip-free nails!